Neo-Pagan ritual operates on different levels at once. Different people can have different experiences in the same ritual, depending on where they are in their spiritual development. Broadly speaking, Neo-Pagan ritual has an exoteric and an esoteric aspect. The exoteric aspect of Neo-Pagan ritual is celebratory. On this level, Neo-Pagan ritual is about celebrating the changing of the seasons and experiencing a connection with the Earth. On a more personal, but still exoteric level, the Neo-Pagan celebration of the changing seasons can be experiences as an outward symbol of inward personal changes. These can be the changes of the human life-cycle or the ebb and flow of enthusiasm that we experience psychologically (sometimes corresponding with the changing of the seasons). Through ritual, we recognize that change is unavoidable and that there is a season to all things, a winter and summer, both inside and out. Part of this is the awareness that we will, one day, die. On the esoteric level, Neo-Pagan ritual is about spiritual transformation of the individual. Neo-Pagan ritual can be understood as facilitating the process of individuation or achieving personal wholeness. Neo-Pagan ritual can be a therapeutic tool for incarnating, consecrating, and integrating the shadow elements of our psyche which have been repressed by our Western guilt/shame culture. Neo-Pagan ritual is a formal way of, in Carl Jung’s words, “making the darkness conscious”. Through ritual, we express an intention to treat all of our drives and temptations with respect and love, so they will reveal their meaning to us. 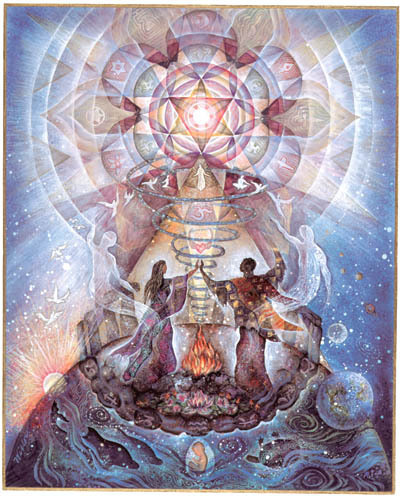 Esoteric ritual may also be a method, not of integrating the psyche, but as a form of controlled dis-integration. A person’s psychic life can be thought of as a cycle consisting of two movements: The first movement is the emergence (birth) of the ego from the unconscious, symbolized by the Mother Goddess. This is the spiritual movement toward increasing individuation, but also increasing alienation, from our Source. Friedrich Nietzsche associated this movement with the Greek god Apollo. But true psychological wholeness requires us to periodically return to the Source and to sublimate our ego. And this is the second movement, the mystical movement, which Nietzsche associated with the Greek God Dionysos. Reunion with the Goddess is experienced as that oceanic sense of oneness that the mystics of many different traditions describe. It is the ego death that is the goal of true initiatory experience. Of course, we cannot remain in that place. The difference between the mystic and the madman is that the latter does not return from the Source. Neo-Pagan ritual can focus on any one of these functions, or it can do more than one. All of them are important. Different people may experience the same ritual differently: as a celebration of and an experience of connection with nature; as a celebration of and acceptance of change in our own lives; as an honoring and welcoming of parts of ourselves that have been neglected or rejected; and an experience of the loss of the sense of self and of union with the transcendent.